You are here: Home » FAN-ATICS » Star Trek » Star Trek Discovery TV series: first trailer. Star Trek Discovery TV series: first trailer. 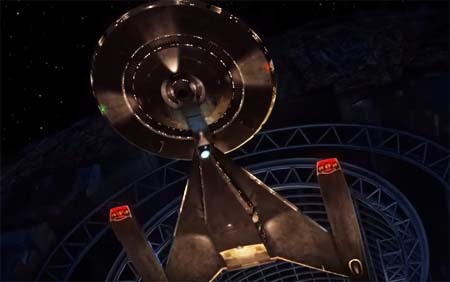 Here’s the first comic-con teaser trailer for Star Trek: Discovery, the upcoming new US television series set in the prime timeline created by Bryan Fuller and Alex Kurtzman for CBS – the first Star Trek series since Star Trek: Enterprise ended in 2005. Set to premiere on CBS in January 2017, the series follows the adventures of the crew of the USS Discovery and the episode plots are not related to the current Star Trek Beyond movie franchise. The USS Discovery is a smaller long range exploration vessel, so it looks like the TV series will be going back to its roots in the original classic Trek mythos. The main name in the frame for the captain of the ship, presently, is actor Nathan Fillion, although he is remaining tight-lipped about the project and his potential involvement in Star Trek Discovery. Star Trek Discovery: If Memory Serves (trailer). Star Trek Discovery TV series: new teaser trailer. Tig Notaro to join Star Trek Discovery cast. Star Trek Discovery second season feature. « Kong: Skull Island second trailer.